Famed Broadway producer Milo Short may be eighty-eight but that doesn't stop him from going to the office every day. So when he steps out of his Upper West Side brownstone on one exceptionally hot morning, he's not expecting to see the impossible: a woman from his life sixty years ago, cherry red lips, bright red hat, winking at him on a New York sidewalk, looking just as beautiful as she did back in 1934. The sight causes him to suffer a stroke. And when he comes to, the renowned lyricist discovers he has lost the ability to communicate. Milo believes he must unravel his complicated history with Vivian Adair in order to win back his words. But he needs help--in the form of his granddaughter Eleanor--failed journalist and family misfit. Tapped to write her grandfather's definitive biography, Eleanor must dig into Milo's colorful past to discover the real story behind Milo's greatest song Love Me, I Guess, and the mysterious woman who inspired an amazing life. 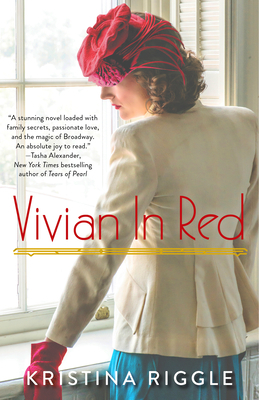 A sweeping love story, family mystery and historical drama set eighty years apart, Vivian in Red will swell your heart like a favorite song while illuminating Broadway like you've never seen before. Kristina Riggle lives and writes in West Michigan. Her debut novel, Real Life & Liars, was a Target "Breakout" pick and a "Great Lakes, Great Reads" selection by the Great Lakes Independent Booksellers Association. The Life You've Imagined was honored by independent booksellers as an IndieNext "Notable" book. Things We Didn't Say was named a Midwest Connections pick of the Midwest Booksellers Association. Her latest novels are Keepsake and The Whole Golden World, which was lauded by Bookreporter.com as "a riveting and thought-provoking page-turner that will appeal to fans of Jodi Picoult and Chris Bohjalian." Kristina has published short stories in the Cimarron Review, Literary Mama, Espresso Fiction, and elsewhere, and is a former co-editor for fiction at Literary Mama. Kristina was a full-time newspaper reporter before turning her attention to creative writing. As well as writing, she enjoys reading, yoga, dabbling in (very) amateur musical theatre, and spending lots of time with her husband, two kids and dog. Visit her online at kristinariggle.net or on Twitter at @KrisRiggle.